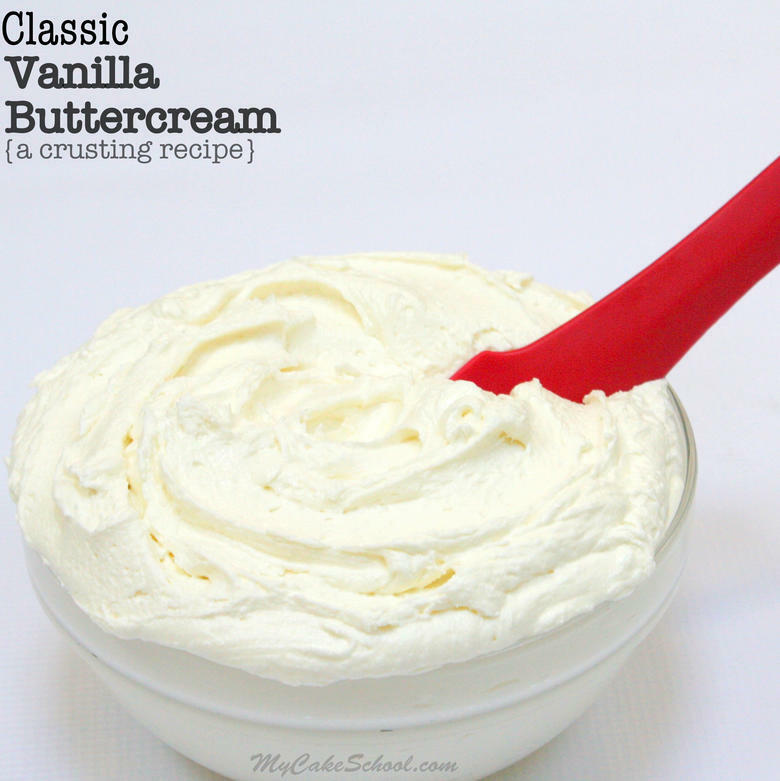 This flavorful, versatile Classic Vanilla Buttercream Recipe is one of our favorites! It has wonderful buttery vanilla flavor, it’s perfect for piping borders or buttercream flowers, and it is so simple to make. Our classic buttercream develops a light crust, and so if you are a fan of the Viva Paper Towel Method of smoothing, this buttercream smooths like a dream! The butter in the recipe also makes it ideal for the hot knife method of smoothing, which involves frosting the cake, chilling until the frosting is firm, and then smoothing it with a hot spatula or bench scraper. Of course, your frosted cakes don’t have to be perfectly smooth. I LOVE textured buttercream as well as the look of piping all over a cake. This buttercream is versatile enough for just about any sort of buttercream cake or cupcake design you can think of. Another bonus for this vanilla buttercream is that you can also easily doctor it to suit the type of cake you are making. For instance, add mini chocolate chips for a Chocolate Chip Buttercream, add a bit of peppermint extract to make Mint Buttercream, or any number of fruit extracts for various fruit flavored buttercreams. The possibilities are endless! As I’ve noted in the recipe below, you can reduce the amount of sugar used in this recipe for a lighter crust. I often do this when making this recipe for cupcakes. Keep in mind that this is an all butter (no shortening) recipe, and so it doesn’t hold up as well in hot conditions. For hot summer days, you’ll want to keep the cake or cupcakes inside until the event, or opt for a shortening-based frosting. We have a couple of great shortening based buttercream frostings in our Recipes Section. One popular option is our Fluffy Vanilla Buttercream, which contains both butter and shortening. Another popular recipe that is shortening based and contains no butter is our High Ratio Frosting. Just like the others, this is a crusting recipe that is great for piping! 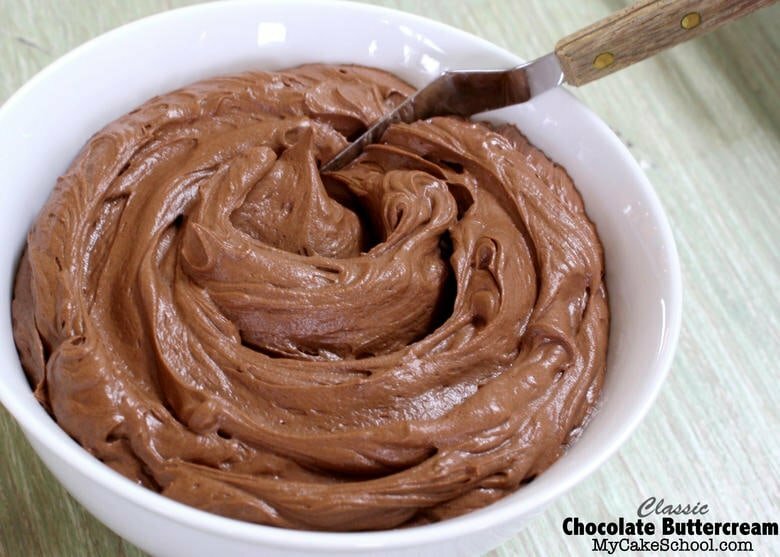 The more shortening that your frosting contains, the lighter the color will be and the more heat resistant it becomes. You do have to rely more on extracts and flavorings when using shortening-based frostings to make up for the absence of butter. However, in times when you need a more heat resistant frosting, shortening-based is a good way to go. 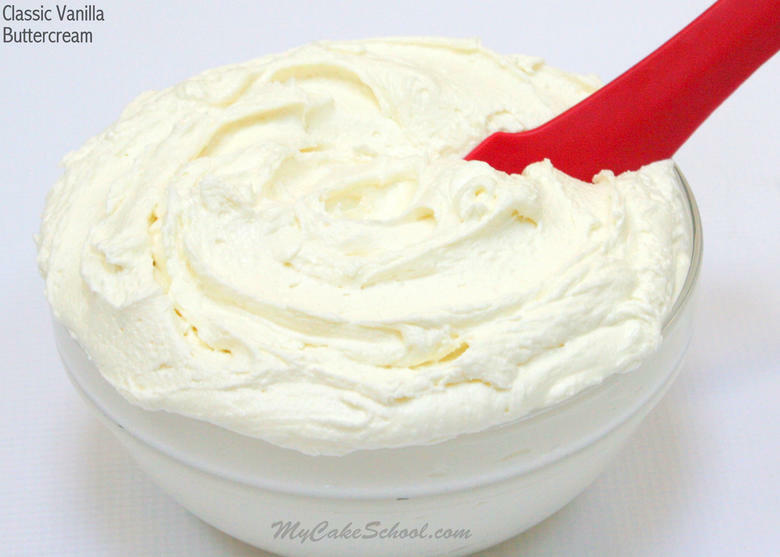 This classic vanilla buttercream recipe is the one that I make most often. We hope that you enjoy it! 6-7 cups (690-805 grams) powdered sugar (depending on desired consistency. More sugar=more crusting). If you prefer a frosting that crusts less, see our note at the bottom of the recipe. *see our note about brands above. **FOR A SOFTER BUTTERCREAM with a much lighter crust, I cut the amount of sugar from 6 cups to 5 cups, and adjust the amount of milk until you reach the consistency you like for piping. This lighter consistency of buttercream works great with cupcakes or cakes that don't require the Viva method of smoothing. ** We’ve had great results with Domino’s confectioner’s sugar and US Sugar (we buy ours from Costco). Some brands of confectioner’s sugar don’t work as well with buttercream frosting recipes. If a package doesn’t say pure cane sugar, it contains beet sugar which is more likely to give you a grainy outcome. In addition to that, we’ve noticed that even some brands that say “Pure Cane Sugar” will give a grainy consistency. So frustrating! One example is Dixie Crystals (although it used to work great for us a few years ago.) Something has changed…it’s a mystery. Anyway, this recipe should not be grainy, and so if it is, experiment with a different confectioners sugar. You can never have too many options when it comes to frosting recipes! I hope you’ll give this one a try. Make sure to stop by our Recipes Section for all of our favorite cakes, cupcakes, frostings, and fillings! Oh, and if you haven’t checked out our Free Tutorials Section, make sure to stop by for all sorts of fun decorating tips, tricks, and ideas! Thanks for stopping by! Now, let’s go make some frosting! buttercream to have a gritty taste. We used to use the brands Domino and Dixie Crystals, both were pure cane sugar. Dixie Crystals must have changed their formulation because it now causes our buttercream to be gritty. You may need to experiment with different brands if grittiness is a problem for you. I am not sure what you mean by roughness so let me know if I have not answered your question. Help. I need to know which frosting recipe will be the best one to pipe rosettes onto a cake with. My daughter-in-law has asked me to do my grand baby’s smash cake for her first birthday coming up in the spring. I will be doing a chocolate cake with a vanilla buttercream and I was looking at your classic vanilla buttercream and your fluffy vanilla buttercream. I was thinking the fluffy, but then I read the comment where the lady tried it on for her daughter’s birthday cake and the rosettes fell off. I have time to practice. Also, can the fluffy recipe be frozen? I was just wondering if a frosting made with butter and milk needs to be refrigerated once it is on a cake or can it be left out like a shortening based frosting? Thank you. Hi Sonja, A cake frosted with buttercream made of shortening and water can be left out without concern. If your buttercream is made with butter and a bit of milk, it can be kept in a cool part of the house and should be eaten by the second day. It can be kept longer if it is covered and refrigerated. The cake will be best if allowed to come to room temperature before serving. What is the best buttercream recipe to decorate a wedding cake. Hello, I tried making this buttercream. It turned out really grainy. I couldn’t pipe it at all because of how grainy it turned out. Could you help me troubleshoot why this could have happened? The butter I was going to use was at room temperature. But because the recipe called for ‘cool to the touch’, I popped it in the fridge for a couple of minutes before trying to make butter cream. Could this be one of the reasons? Could it be due to sugar? I used C&Hs confectioners sugar. I used Kitchen Aid Stand mixer. Hi Shivani, I’m sorry that your buttercream had a grainy consistency. It definitely shouldn’t be. I would experiment with a different confectioner’s sugar. I’m not sure if you noticed our note beneath the recipe and so I’ll paste it below– I really think it must be the sugar. We’ve had great results with Domino’s confectioner’s sugar and US Sugar (we buy ours from Costco). Some brands of confectioner’s sugar don’t work as well with buttercream frosting recipes. If a package doesn’t say pure cane sugar, it contains beet sugar which is more likely to give you a grainy outcome. In addition to that, we’ve noticed that even some brands that say “Pure Cane Sugar” will give a grainy consistency. So frustrating! One example is Dixie Crystals (although it used to work great for us a few years ago.) Something has changed…it’s a mystery. Anyway, this recipe should not be grainy, and so if it is, experiment with a different confectioners sugar. Thanks for the quick response. I probably failed to read that note as I was working on this late in the night. In your experience, have you seen one brand of sugar working really well with one recipe of buttercream and failing miserably in another? I used the same C&H in fluffy-vanilla-buttercream recipe (link to mycakeschool.com) and it worked wonderfully in that recipe. Hence my confusion. At some point I was also thinking if it could have been the speed at which I operated the stand mixer? I did run the Stand mixer at 6 for a brief period and then 4. Would 6 be too fast? I don’t know :(. Anyhow, I really appreciate you taking time to answer my question! Thank you. The sugar which i powdered can i use for this recipe..
Hi Aathi, We have never made our own powdered sugar so I’m not sure of the outcome. If you give it a try, please let us know the outcome. Hi Melissa? Love love love your website. I’m growing a pastry business in NYC and I’m amateur baker although I’m doing for over 15 years I never went to school or anything like that so I find this site very educational and helpful especially for bakers like me that can not afford a pastry school. I have to make a unicorn cake which has piped flowers on top and side. Was wondering if the buttercream recipe is thick enough to hold the side flowers when it is a room temperature ? Will they stay there whitout falling all over to the bottom ? The reason why I asked is because I tried the same thing last weekend whit a cream cheese frosting and it didn’t work really well. Hi Natalia- Thanks for your kind words about our site! We are happy to have you! Yes, buttercream holds up much better to piping flowers, etc. than cream cheese frosting. Our unicorn cake is a buttercream cake also– I happened to use a different version of buttercream (which contains some shortening) for that video, but I wouldn’t hesitate to use this one either. It’s a great recipe. Good luck! !